VAT really isn’t equivalent to a sales tax. First, the VAT is built into the price, so consumers are mostly unaware. Second, it is based, not on a percentage of the sale price, but the difference between what the seller purchased it for and the value he added to it. So, if the seller bought the piece for £100, marked it up to £190. the VAT would be based on the £90 increase, not the £190 cost. Without know the original cost to the store, one has a two-variable problem and there are not single value solutions for two-variable problems. The solution would be a graph with the VAT as an inverse value of the cost. 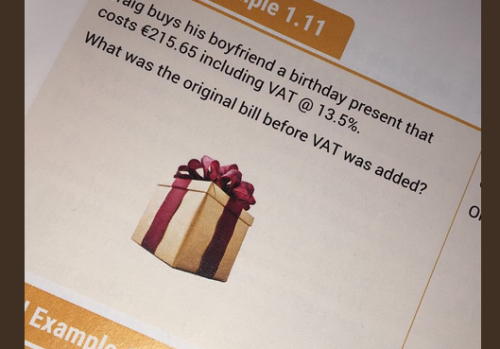 So, for example, if the seller got the piece for free, the VAT basis would be zero and the price minus the VAT would be £190 ( ((S – C) x 0.135) + C = V + C, where C = Aquisition Cost, and S = Retail Sale Price, V = amount of VAT). However, if the shop sold it at cost, the cost would be £215.65 as the VAT would be zero as £215.65 – £215.65 = 0 and anything, even 1.135 x 0 is 0. I get £190 even *IF* one assumes a zero cost basis. didn’t we discuss literal pedantic mental already? this is exactly why I objected to your attempt to use me as validation against Jomicur. I wonder if you would help me work out a math story to calculate the odds of the event having occured. in 1980, in a rural high school with 900 students – a grade 8 math class with 35 students. the teacher begins to explain a math problem of a plane leaves LA and a plane leaves NY. the teacher gets distracted by the need to overexplain planes and asked the students how many have been on a plane. all 35 say they have. The teacher then spends the entire hour of class on having each student say where, when and why that they had flown. 1 student had flown in a private small plane. the math teacher could not figure out the odds of all the students having flown. how would you go about solving that math problem? but better math teachers would have been an acceptable response. I would put the odds at about 1 in 50 million, but that’s just a guess. I’d lived in three other urban communities. He missed the statistics classes in school or read it wrong. One of my friends from high school is a college professor and teaches classes in statistics. I would love to run this by him: he will have the right answer! I went to public school in the 1980s when girls were discouraged from math and science, and it was only in the late 1970s that the University of British Columbia allowed women student to wear dress pants. I sent this question to Dr. Linfield in Kentucky. Waiting for the answer! amazing, thank you and much gratitude. the towns were rural Chilliwack BC and the city was New Westminster, BC. (it was supposed to be the capital, but Victoria on the island was picked so the American’s couldn’t siege it. history, nothing personal. lol, eh. just for further data extrapolation if this proves interesting. when I was in college the textbook for the statics class was actually called “how to lie with statistics”. It would have been the most useful of all classes for me to have studied, for the profession that I ended up in, Gen X over educated, underemployed and made a round of the non-profit to private to public sectors. The odds are very clear: 100%. The odds of any one student having flown in a class in which all students have flown is 100%. no. that is not the correct answer nor demonstrates any understanding of the post. in fact, if that was even the answer, why would I bother to post and ask for such a facile reply? your cognitive comprehension and inability to glean information is not a credit to your law school. what are the chances of that event story occurring, given those variables. you changed your profile and missed the story part of the math problem. also, you never answered my question about going from paralegal to senior associate and the whole resume stain of support staff, rather than junior associate as a first year call would be. Our firm is not a traditional, white-shoe law firm with a rigid hierarchy. We are very much a collective. We also don’t really invest in titles. The senior partner and I are good friends, went to law school together, and I tutored her. Thus, the question really doesn’t have a good answer. We are in Turlock, not New York or San Francisco, so much of that ranking stuff isn’t an issue. Sorry. Jomicur, I have never once suggested, let alone stated, I was ever associated with Phoenix University. Thus, it is not a lie, because the claim does not exist. Yes, Humphrey’s University is my school. It is in Stockton, California. The autocorrect changed the spelling and I didn’t notice, sorry about that. The school was Humphrey’s College when I went there. The rules of evidence are not about how to evaluate testimony, but about whether something may be admitted at trial to establish or disprove a fact. You are welcome to call the Dean at Drivon. He will confirm my graduation. I continue to help out with the expungement clinic and am there four or five times a year. He remembers me. Why are you so angry? You seem continually upset and combative. Nina and I are having a perfectly pleasant discussion and bop with nothing more to contribute than nastiness. Why? Who hurt you so badly? I don’t bear you any ill will. I like you. I think you are a smart, intelligent person whose input is generally welcome. Why the antagonism today? Particularly since able to communicate in a civil manner is merely a social skill; and it’s advanced to be able to be social with those one disagrees with; and s not any type of social endorsement of either party. in fact, Jomicur is one of the posters on this site I deem to be a social-able poster, and who’s POV I generally agree with. your trying to use me posts to validate your own is a serious social faux pas on your part. Jomicur is an LGBGT2 community elder deserving of respect. and law is one of those title sensitivities industries. it;s funny other other industries with less education use titles as intangible rewards rather than fair compensation for work. Yes, very small town. Truly, we even bring our dogs to work. Do you folks in Canada have the British barrister/solicitor distinction? Do lawyers still wear wigs to Court? I would love to go North and observe for a couple of days. it is fun to wander into court and just watch for the dayanyone is allowed to and few people do. yes, the older firms even display the original’s partner wigs in the lobbies. We enjoy our pomp n circumstance and do not allow cameras in court. Sketch artists are employed for all media purposes. I worked at a small firm in Vancouver, I brought my dog there. She was in a Big Firm Downtown and I was in a boutique firm on the poor side of town were few professionals set up shops in a being re-gentrified neighbourhood – Mount Pleasant, Vancouver BC. “No.” I said, “I might be a junior, but I do know enough to know that if you want to talk to our client, that your firm doesn’t sign my paycheques, and it”s paperwork for your bosses signature. so. if you ever deal with bigger firms, they pay attention to titles more than you might realize. The real problem is there isn’t any quick and easy way to control for the variables and many of the factors are non-random. I found a statistic indicating, by 1972, more than half of all Americans had flown on a commercial aircraft. My guess, without data, is the percentage would be lower for 8th graders, but there doesn’t seem to be a ready database with that information. Second, we can’t control for factors that would change the percentage. For example, I suspect, without data, children from wealthier homes would be more likely to have flown that from poorer families. Children near popular airports, like San Francisco, for example, as a guess, would be more likely to have flown than children in North Platte, KS. Children in Hawaii seem more likely to have flown because it is the only really practical way of going to or from that place. However, assuming facts that simply aren’t provably true, but might be approximately true, that each child has the same chance of having flown as the general population, the odds are the same for all children from whatever background or location, and all other factors are the same, the odds of any one child having flown over 50/50. The odds of all 35 children having flown would be the same as a coin toss where one flips heads 35 times in a row. Thus, the odds are 1 out of 2^35, or 1 out of 34,359,738,368 or about 34 billion to 1. As there only some 7 billion people in the whole world, I’d say the whole class having flown, given the assumptions, is bloody unlikely. Again, the events aren’t random. For all we know, all of the children flew on a field trip in the seventh grade, so that is why they had flown in the eighth grade. Maybe they were all children of Air Force service members. there were two high schools.the math class I was in was not military kids, it was 34 mostly farmer kids all born in chilliwack.30% of the school was Ingenious student from the reserve.I was the only moved around one. all lthe flights were family vacations to other relatives in canada or Disney family vacations to the USA. on commerical flights. mine was a private fly over Vancouver in a small plane. rather than attempting to make a determination based on facts provided. and then you question the facts. with revealed in a math class by a teacher who had no idea how to begin to work out the math as the literary kicker to the story part of the math. why not just admit you have no idea how to proceed or solve it? As you say, “the question is, what was the probability of 35 students in a rural town in 1980 all having flown.” Tell me the odds of any one student “in a rural town in 1980…having flown” and I can tell you the answer. Where the answer to that question is X, the answer is X^35. I did my best to answer your question. If you don’t like the answer, oh well. The answer you seek is based in your data set, not the use of statistics. You haven’t supplied the odds of any one student and discovery them now is likely not practical. rather than admit you don’t know. I don’t know about blame here. I certainly can’t solve the problem and have said so. I can’t compute the answer because the data set is incomplete and I do not have time or resources to discover the data necessary to solve the problem. Neither do you, btw. I suggest the problem is unsolvable, more than any failing on my part. Of course it is a formula I’ve been taught. I have never applied myself to higher math to develop original work on my own. There isn’t any shame in applying what we’ve learned. That is certainly better than ignoring it. Notice, however, I am the only person who tried to answer. You don’t seem to acknowledge you have provided inadequate data or any answer to the math I’ve provided. Do you claim any computational errors? Do you think there is some other valid approach? If you are really, really, really insist there is a solution to this problem based on the data you have supplied, I will contact Andrei Okounkov, who I met when I was at MSRI. I doubt he’d remember me, but he won the Field Medal “for his contributions bridging probability, representation theory and algebraic geometry.” He is a very nice person, but I would guess very busy. If anyone can solve the problem, my guess he could. However, i do not understand why you are being so derogatory when I am the sole party trying to help you with the problem. This entry was posted in Agoraphobic Philosopher, bisexual, Gay, lesbian, LGBTQ, Raw Recovery Specialist, trangender, Zeitgeist Analytics and tagged British Columbia, Canada, Chilliwack BC, civil conduct, cognitive, degree, Dr. Linfield in Kentucky, manners, math, math class, math teacher, narrative, New Westminster BC, Peacekeeper, professors, rural, social iq, statistics, statistis, story problems, student class size, teachers, travel, urban. Bookmark the permalink.